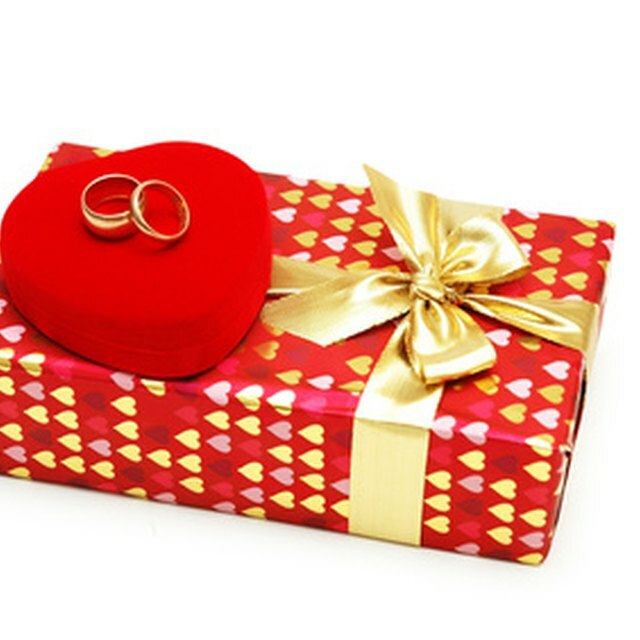 Gifts given by wedding guests to the couple are traditionally items the newlyweds would need in their home, or that they have registered for as wanting or needing. However, Filipino weddings honor tradition with guest presence during ceremony instead of the presents at the reception. Within the culturally charged Filipino weddings, traditional gifts include money or jewelry given by the wealthy guests, and custom states that a chamber pot, called an arinola, is said to bring good luck to a new couple. Perhaps a modern spin on this would be bathroom items or toiletries. Gifts are returned in favor when the guest was later married. For instance, if a guest brought fruit, the guest would receive fruit in return at their wedding. Filipino wedding receptions traditionally have a dollar dance or money dance, in which money is pinned to the bride or groom by guests paying to dance with them. A closely followed superstition affirms that it is bad luck to give knives or pointed objects to the bride and groom, with the thought that it will sever the marriage. Wearing pearls given as a gift is not standard for Filipino brides because pearls are thought to signify the tears the bride will cry during her marriage. However, a gift of an heirloom rosary is the usual bouquet adornment. Breaking a glass or dish during the reception is common because it is said that it brings good luck to the couple, so glassware may be an appropriate gift. The couple or their families may also present eggs and fruit to the sisters of the monastery of Saint Clara, the patron saint of good weather. “Claro” means unclouded or clear in Spanish and the whites of the eggs are thought to bring clear skies and weather. Filipino weddings, called kasals, are typically a full Catholic mass and last about an hour. During that time, there are several sponsors within the wedding party that participate by offering gifts to the couple. Coin sponsors present unity coins known as Arras that symbolize the prosperity of the new couple and their contributions to the marriage. Veil sponsors present the white veil that is placed over the couple to symbolize their union as one under the presence of the Lord. Cord Sponsors place a knotted cord over the heads and symbolize the union of two becoming one. Candle Sponsors present and light candles leading them to the light of Christ as a new couple. In contrast to American weddings, Filipino weddings are much longer since a nuptial mass is standard. There is also a larger reception, sometimes nearly 500 or 600 people, instead of the American 200-ish guests, full of ethnic dishes, meats and many cakes instead of one. Much like the single female guest catching the bouquet, the single guest who follows in a newly married Filipino couples footsteps during the reception is said to be married next. Modern Filipino wedding gifts follow the customary money and jewelry but take a more personal note such as heirloom or estate jewelry passed through the family, or significant amounts of money to begin a new life together. Jessica M. Denmark is a PR/Event professional living in Savannah, Ga. Writing for more than a decade, she has been published online and in print. In between planning events for Savannah visitors and organizing weddings for Southern brides, Denmark maintains book review blog, jessicaetcetera.